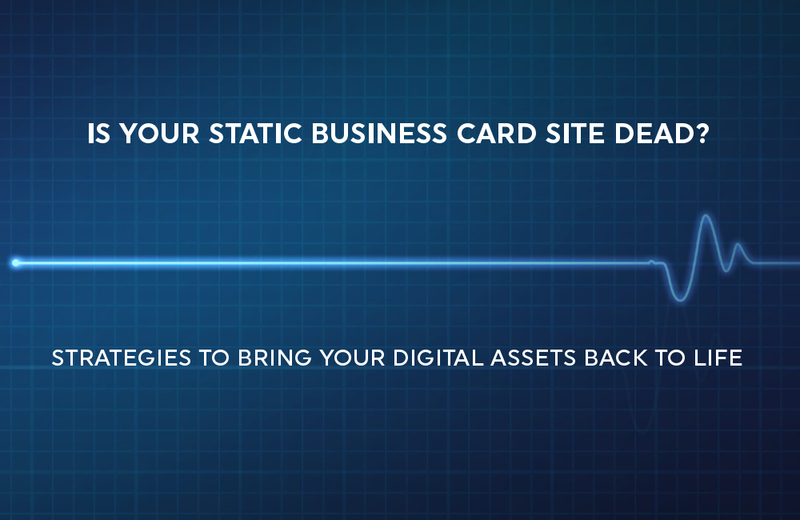 Static Business Card Websites Are Dead – Sellience Blog – Always be Closing! That is a bold title, but truth be told if you are hosting a static website, it is the equivalent to a business card that collects dust on a desk or lines the bottom of a trash can. We are blessed with growth opportunities for our businesses through digital marketing in ways that have never been possible before. However, far too many people see a website as a necessary evil, and sadly not much more. That, my friends, is a missed opportunity for most businesses. Arguably, even, all businesses… Of course, there are some exceptions, but for anyone relying upon generating new leads and customer acquisition, digital marketing presents a potential goldmine. Content Creation – Blogs, videos, articles, memes, infographics, and images have the potential to attract visitors to your website and other digital assets, such as social media accounts. Engaging content can bring visitors back time and time again. A single visit to a website or digital asset rarely leads to a sale, so give visitors a reason to see your company as a resource. Call-to-Action – Also known as CTAs, call-to-action efforts encourage visitors to engage with you. Value-based opt-in tools, such as reports, “how to” documents, training videos, or any number of items that you can provide help show that you care about your visitors. Are these items designed tosell your servicesor can they make the recipient’s life better in some way? The latter is always going to trump the former. Be selfless and learn to give to receive. Selfish practices or overly salesy messages rarely drive relationship building. Chat Tools – Depending on your industry, Chat Widgets and other chat tools can productively take advantage of a captive audience’s time on your site. By prompting visitors to engage in a live chat, website owners can significantly reduce site abandonment of interested potential buyers. Chat interactions between a website visitor and an actual customer representative are beyond valuable for most businesses. Chatbots – While live chat is the most desirable, technology has presented site owners with a powerful option that is more automated. Chatbots can be developed to ask questions, provide timely responses, and guide a visitor through a journey controlled by a pre-scripted Q&A session or guided discussion on any given area of that business. On-page Popup Tools – Various tools can be leveraged to attract a visitor’s attention and can be a CTAs best friend. Visual movement on the screen can be subtle but strategically positioned to draw a visitor’s eyes to an opt-in form, or any number of call-to-action tools, or even value-based downloads. Exit Intent Popup Tools –Exit intent popup tools track a visitor’s mouse movements,and when the cursor moves toward the address bar of your web browser, a popup window is shown. These tools allow visitors another opportunity to see the value of your brand before they abandon your site for good. If you are hoping to turn your static, business card website into a robust marketing tool, it’s important that you understand what is possible for your niche market. So often companies invest in SEO or other such campaigns when they are not a fit. Or they target keywords which are far too competitive, and they end up disappointed with the results. If you would like some guidance or if you have questions on your own path, feel free to contact me directly at paul@websitesandleads.com.